Yang-style Taiji Quan is the most popular kind of Taiji in the world. It has won the favor of people for hundreds of years and made great attribution to human being health. This is a collection of essence routines of Yang-style Taiji Quan, chosen by teacher Fu Sheng-yuan, including traditional 85 Yang-style Taiji Quan, 8 Circular Postures of Taiji, Big-pole of Taiji, 8 Methods of Pushing Hands of Taiji and Appreciation of Pushing Hands, Distilled 28 Postures of Yang-style Taiji Quan, Wheelchair of Taiji Quan, Yang-style Taiji Broadsword and Taiji Sword. 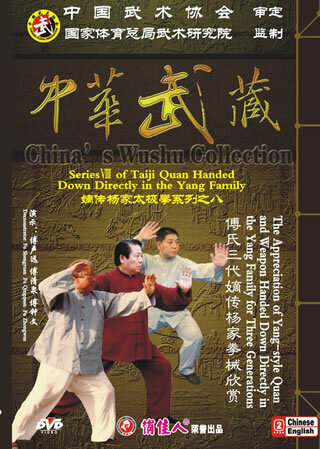 It has exhibited well the features of Yang-style Taiji Quan so that it is worthwhile collection for Taiji Quan fans.